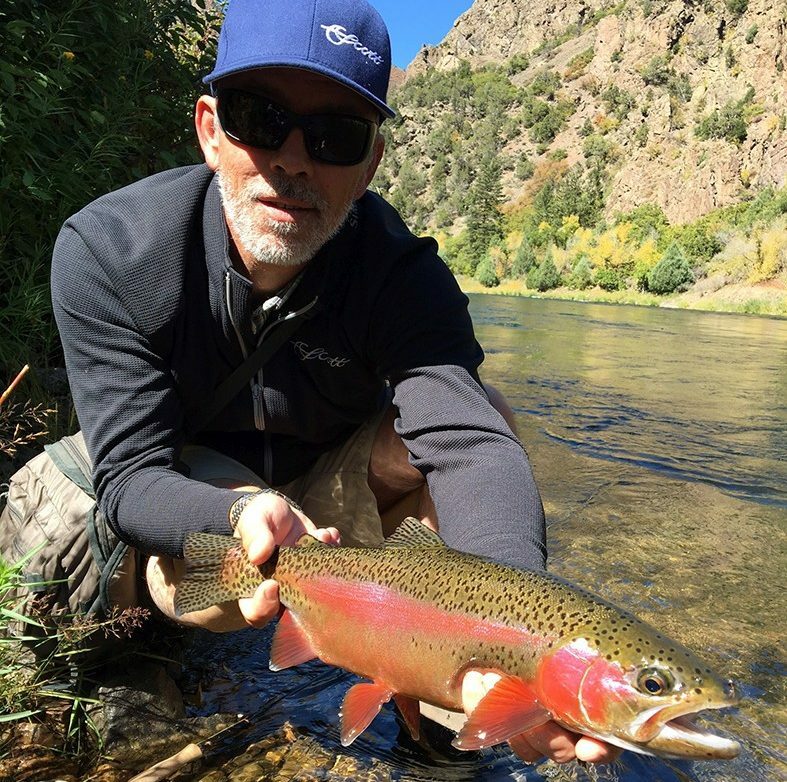 Peter is one of the most credentialed fly fishing guides and instructors in the world. Peter has been the Australian Casting Champion a total of ten times and he has twice represented Australia at World Championships. A twice silver medal winner at these events, on one occasion Peter cast a single handed fly rod an incredible 74 metres or 2.7 normal flylines. In 1998 Peter also won the Australian Fly Fishing Championships held in the Snowy Mountains. This win earned him a place as the ‘number one’ qualifier on the Australian team to compete in the World Fly Fishing Championships, to be held in Australia in early December 1999. In May 2000 Peter was again selected to represent Australia at the World Fly Fishing Championships held in Bristol – England. For Peter, a career highlight was winning a bronze medal at this competition, the peak event of the sport of fly-fishing. Peter was also able to catch the largest fish of the competition, a brown trout of 61.5 cm on a dry fly from the River Test. 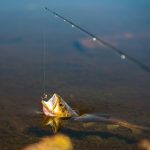 It is a rare skill to combine the two disciplines of competitive casting and competitive fishing and to date there are only two people on the planet that have won medals at both World Fly Fishing and World Fly Casting Championships. In October 2007 Peter became the first Australian to be recognized by the International Federation of Fly Fishers (IFFF) as a Master Casting Instructor. This is the highest level of casting instruction certification possible. In 2012 Peter was awarded a prestigious position on the Casting Board of Governors (CBOG) of the IFFF. Over the past decade Peter has conducted his international casting program in China, South Africa, New Zealand, Malaysia, Indonesia and the USA as well as at home in Australia. Peter started guiding in 1994 after more than a decade working as a mechanical design engineer. He quickly developed a growing repeat clientele that have fished with him now for over 20 consecutive years. 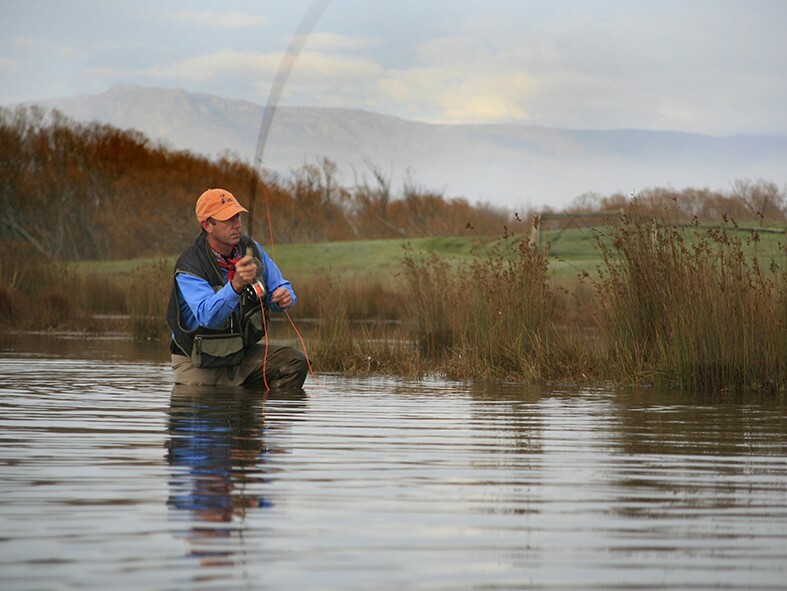 Extensive trout fishing experiences in North America, New Zealand, the UK and mainland Australia have stood him in good stead in his homeland Tasmania. Also no stranger to salt water fly- fishing Peter has competed successfully in the Broome Fly Rod Sailfish Tournament on two occasions. 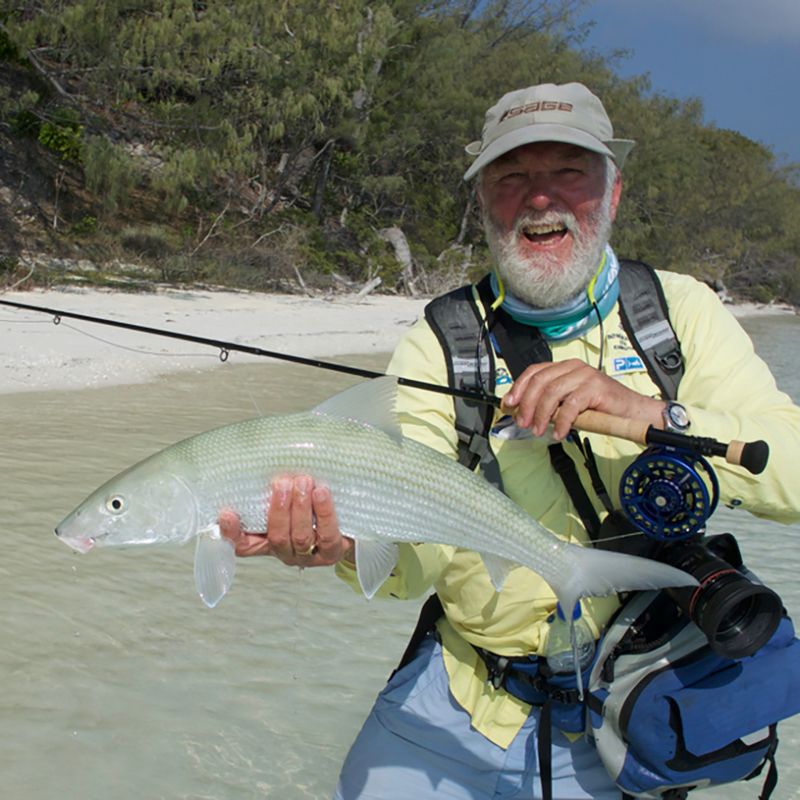 He has fished throughout Northern Australia and International destinations for all manner of species from Bonefish and Barramundi to Tuna. Martin Droz is one of the world’s best ever fly fishing competitors and is the first ever multiple world champion (4 world championship gold medals) to guide in Australia! Martin has been passing on his river fishing skills to Australian anglers during his brief visits to Australia over the past few years. He has been employed by Fly Fish Australia as the skills coach and technical advisor for the Australian national fly fishing team. In 2017, his immeasurable contribution helped Australia to our best ever world championship result on mainland Europe. 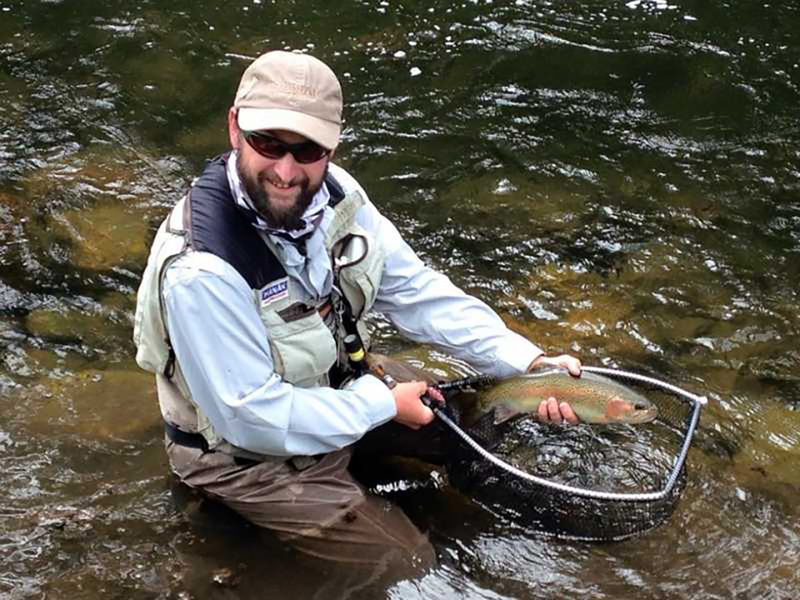 From European nymphing to dry fly and wet fly fishing, Martin understands it all. 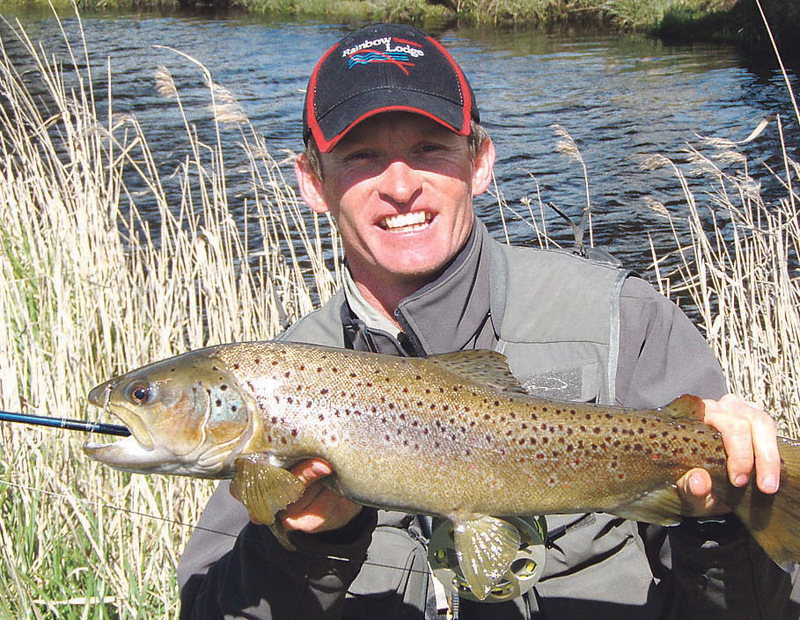 He is seen as one of the world’s best river anglers, and is also at home on Tasmanian lakes. Martin won a staggering thirteen international medals between 2004 and 2014! Martin has also won four team World Championship gold medals, two silvers and one bronze along with three other European team gold medals! Martin’s ﬁrst world championships was in Australia in 1999 and he has won multiple Czech titles and medals in his home country. His teaching and guiding experience extends throughout many European countries and across the globe. Amongst his peers there is no argument that he is the best in his ﬁeld. His sense of humour, patience and humble, caring nature, endears him to all. With a resume never seen before on Australian soil, his popularity is obvious. Martin has come to Australia from the Czech Republic to guide for Rainbow Lodge Guided Fly Fishing Tasmania. Martin will be at the Expo both days, so drop by and talk to him about rods, lines, flies, techniques and more. You will find him hanging out at the Mayfly Tackle stand. Jim Bartschi is the President and Rod Designer for the Scott Fly Rod Company. Bartschi has been designing Scott fly rods for over 20 years, so if you’ve fished a Scott rod, there’s a good chance you can blame him. How rare it is to get a premium rod designer to hang out with and learn from. Take advantage of this. 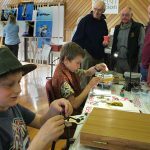 Judith is late comer to the world of Fly Fishing and became the first female FFI Certified Casting Instructor in the Sothern Hemisphere with the help of Peter Hayes at Cressy. She is still very much the perpetual student with an inquisitive mind and has a gentle natural style and approach as a Fly-Fishing Instructor. Her idol is Joan Wulff and she has been very fortunate to have spent time with Joan in New York State. After returning from meeting Joan I was rapt to help Peter Hayes begin the Girls Gone Fly Fishing Weekend Workshop. This annual weekend event has grown to become a wonderful avenue for women to not only meet and exchange ideas but aimed at increasing skill levels while having fun at the same time. The natural world has always captivated her interest and the introduction to fly fishing just seemed to feel right. From the challenges of saltwater to the technical skills of freshwater fly fishing keeps her busy planning new adventures to incorporate both passions, while still working full time job as an Orthopaedic Nurse in Sydney. 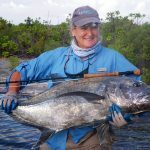 Judith has travelled to many destinations around the World fly fishing, both fresh and saltwater. 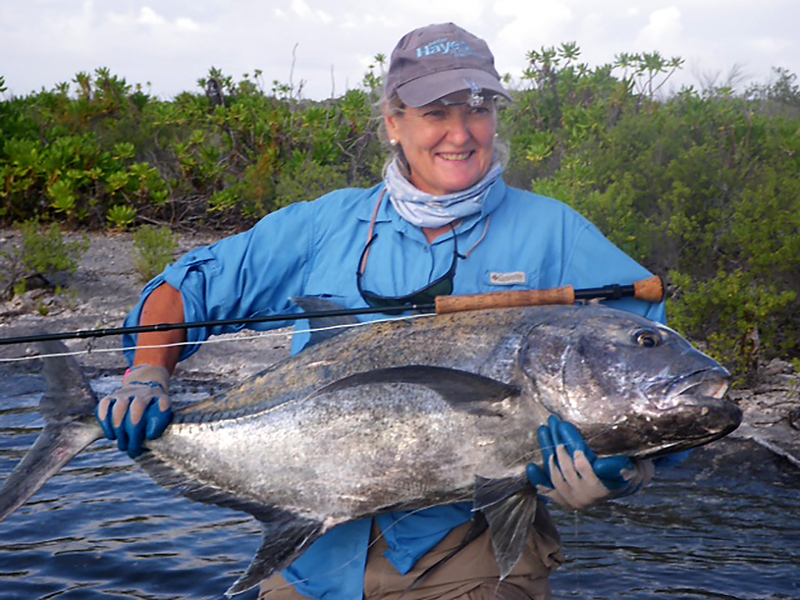 Judith will be running the Ladies – Lessons in Fly Fishing at the Expo. You will need to book. Tino Pittiglio is 13 and has been a die-hard fly fisherman since we first moved to Tasmania when he was 8. Even then he was known to spend 4 hours sitting on the bank of a dam trying to catch trout or salmon using dead flies he would collect from around the farmhouse. When Tino was 10 he started to tie his own flies and he attended his first Bronte Fly Fishing School when he was 11. He was hooked! He loves the ‘hunt’ that is fly fishing and especially enjoys reading the water and understanding the entomology required to catch fish. He also loves his fishing ‘mates’ – and will sit for hours chatting to them about their latest catch, what flies are working for them etc. He is very pleased to be returning to Bronte Fly Fishing School this year as a casting coach for juniors and participating this event. 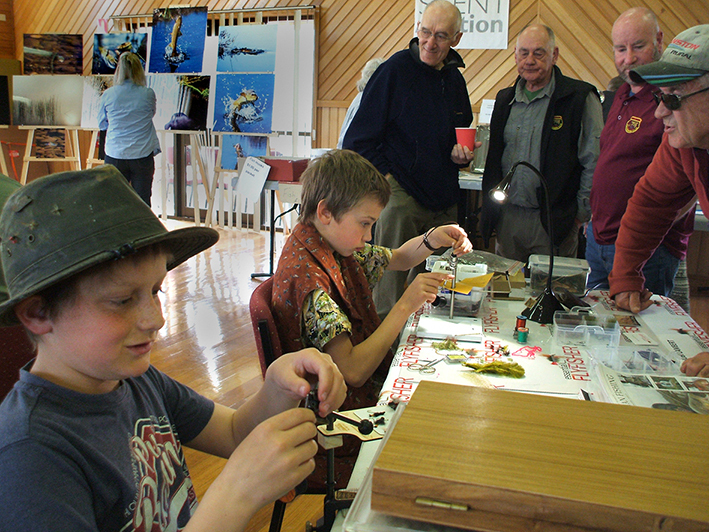 Kobi Lambert is twelve years old and has been tying flies since he was eight. A family friend started him off and it quickly became an obsession. He is mostly self-taught using books, DVDs and youtube. He has also been given plenty of advice and encouragement from other tyers. In order to fund his hobby Kobi began selling flies at local markets a few years ago. He has a regular stall at the Deloraine and Mole Creek markets each month where people love to watch him tie. Mike and Jules at the Essential Fly Fisher have also been very supportive of Kobi. Kobi has participated in the Great Lake Tie In and The Liaweenee Trout Open Weekend. Tino and Kobi met at the Bronte Fly Fishing Camp in the summer of 2016 and enjoy getting to catch up at fly tying/fishing events. Peter Morse grew up in Fiji where from an early age he fished from the family boat trolling handlines for mackerel, trevally, tuna and coral trout. His father and his grandfather were fly fishermen and Peter has fly fished since the early ‘70s in freshwater and in saltwater. He has written extensively on the sport for magazines and has written three books. 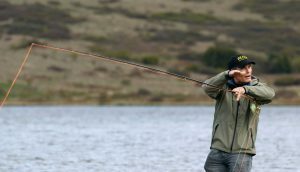 He is well known by most fly fishers in Australia through the Wildfish series, but has also taught fly-casting for several decades. 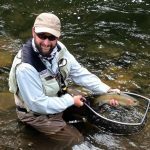 Peter is a Sage Ambassador and RIO Ambassador as well as a Certified Master Casting Instructor with the US body Fly Fishers Intermational. He conducts fly casting and fly fishing clinics all over the country from novice level through to training other potential instructors. Without prejudice, he chases with fly tackle whatever swims and has landed over 300 species on fly tackle. He has fished around the world from the jungles of Brazil to the flats of Mexico and Florida, throughout the South Pacific, to the chalk streams of southern England. His favourite 10 species are. In 2017 Peter was awarded the Fly Fishers International Mel Krieger Instructor of the Year Award. There is no fly fisher that hasn’t heard of Peter Morse. He is a terrific ambassador and his extensive knowledge is shared in an easy to understand way. Steven will be presenting perhaps the most amazing collection of trout action photos ever seen in Australia. There will be photos for sale and these will be limited to a very small number. The gloss and lustre of these prints has to be seen to be appreciated. Stevens explains his passion below. ‘It all started as a child when I use to sit with a piece of string dangling from the end of a stick into a stormwater drain. Such was my obsession for fishing that even though my string had no hook tied to the end of it I would sit there holding that makeshift rod until I would fall off to sleep. This set the path for my obsession with fishing throughout my life. Some 40 years later and that passion is still as strong as ever, although these days I’m usually holding a flyrod or camera instead of that stick. Through the years I found myself more and more drawn to the visual aspects of fishing, there is something about being able to visually spot a fish, sight cast to it and then watch it as it slowly rises under your fly. That anticipation as you watch the events unroll is pure addictive, such is the buzz of visual presentations it just leaves you wanting more. Luckily with Tasmania being my home, I’m surrounded by an abundance of visual opportunities when it comes to chasing trout. Those early morning tailers in the shallow margins, the hopper feeders of the meadow creeks, those clear waters cruisers of the western lakes, the leaping spinner feeders in the river or those caenid sippers are just part of that visual smorgasbord on offer for the fly fisher. Captivated by the behaviour of trout and mesmerised by many of the beautiful moments on the water, I found myself wanting to be able to capture a piece of that magic. Quite often things happen so fast on the water that it’s a blur, photography though gave me the ability to capture a tangible visual snapshot of that amazing moment. Thus my passion for photography grew, step by step and inspired by the great photography presented in magazines such as flylife I worked on crafting my photography skill base. My goal has always been to take photos that inspired me, that take me back to that moment on the water, it’s a privilege to inspire others along the way. These days I will be waiting out there for that elusive fish, perhaps to the point where I nod off to sleep again, but there is no place I would rather be. 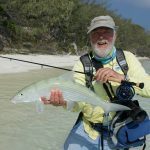 Christopher has fished extensively throughout the world in both fresh and salt water in such places as New Zealand, South Africa, England, Ireland, Scotland, Wales, The United States, The Seychelles, Bahamas, Japan and many more. During the winter 2009 he guided in the north of Australia chasing Sailfish, Black Marlin, Giant Trevally, Tuna, Queenfish and Barramundi and others. He has fished practically every piece of water Tasmania has to offer and has a greater knowledge and understanding of the fishing opportunities. With over 20 years of experience, Christopher is renowned for his knack of finding fish – even on days when everyone else has packed up and gone home. Whether it’s fishing from boats, polaroiding fish from the shore, walking into the beautiful wilderness of the Western Lakes or fishing the delightful rivers and streams of the lowlands on foot or from our raft, Christopher loves it all. Christopher has a home on the banks of the St. Patrick’s River in Tasmania’s North East with his wife Krystal, and two daughters Sage and Sidney. The pristine freestone stream that runs through his garden offers wonderful fly fishing opportunities. In 2006, Christopher was the ‘Coach’ of the Australian Fly Fishing Team at the World Fly Fishing Championships in Portugal. Christopher has represented Australia at the World Fly Fishing Championships on four occasions – in Norway 2013, Bosnia 2015, Colorado 2016, and Slovakia 2017. 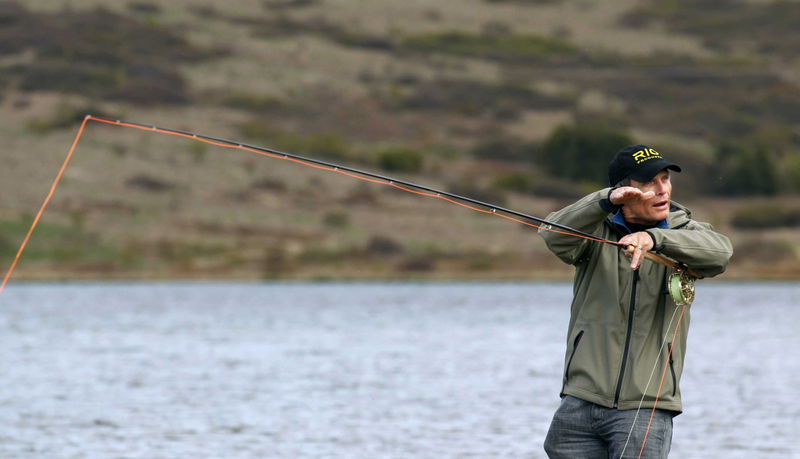 He won both the individual and team gold medals at the Commonwealth Fly Fishing Championships held in Tasmania in 2012. He is the current Australian Fly Fishing champion. In 2017 Christopher once again represented Australia at the World Fly Fishing Championships in Slovakia, where he finished an impressive 6th place overall individually. 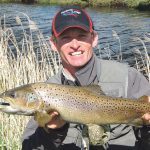 Christopher writes and has written extensively for many fly fishing publications in Australia and internationally and has been featured on the front cover of the Japanese “FlyFisher” magazine amongst others. Christopher has his own range of flies tied by the world renowned Fulling Mill company that are available for commercial same throughout the country. Appearing on many fishing shows on both television and DVD’s, Christopher also presented and produced the highly acclaimed “Tasmanian Fly Fishing Techniques Volume 1 and 2” – Tasmania’s best-selling fly fishing DVD. 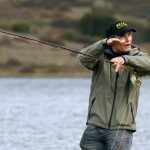 Simon learnt to fish at the age of 6 and took up fly fishing when aged 8, being trained by his father – well known fly fishing instructor and author, John Gawesworth. By the time he left school at 16 to teach fly fishing Simon had become the British Junior casting champion, repeating the feat the next year. In the following years Simon broke seven British casting records and won the adult casting championships three times in succession, representing England in two European and one World Team Championships. 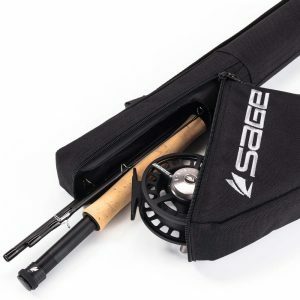 With the collapse of the British Casting Association and the tournament casting scene in the UK, Simon turned his hand to competitive fly fishing. Over the following years Simon represented England in three home internationals (against Ireland, Scotland and Wales), two European championships and five World Championships, culminating in the prestige of becoming the England Team Captain and Manager for the 2003 World Championships in Spain. 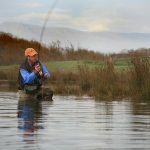 During his career Simon has written numerous articles for the fishing press, published two books on spey casting, presented five instructional videos and DVDs, appeared on numerous television and radio shows, demonstrated casting at fly fishing shows around the world and is recognized as one of the leading authorities on Spey casting and fly casting instruction. He is a FFF Master and THCI (Two Handed Casting Instructor) certified instructor and also holds the APGAI and STANIC diplomas for Fly Fishing Instruction in the UK. Simon lives in SW Washington and works for RIO Products, where he designs and tests fly lines, as well as being the Brand Manager for RIO. He conducts fly casting classes and seminars around the world. Simon is married with two children. Simon’s love of lightweight switch and two handed rods will be something to behold along with his huge knowledge on flylines. Meeting, listening and learning from Simon will be worth the visit on its own.